Madison Avenue advertising man Roger Thornhill finds himself thrust into the world of spies when he is mistaken for a man by the name of George Kaplan. Foreign spy Philip Vandamm and his henchman Leonard try to eliminate him but when Thornhill tries to make sense of the case, he is framed for murder. Now on the run from the police, he manages to board the 20th Century Limited bound for Chicago where he meets a beautiful blond, Eve Kendall, who helps him to evade the authorities. His world is turned upside down yet again when he learns that Eve isn't the innocent bystander he thought she was. At the South by Southwest eco event, there were all kinds of programs and presentations. They ranged from panels about LEED buildings to a very good series of sessions on new technologies. Outside, you could test drive a chevy Volt. There weren't any exhibits, but Senator Byron Dorgan showed up to make a keynote. Coincidentally, there was also a Gulf Coast Power Generation meeting in the same UT facility that was ending as SxSW eco was starting. I was fortunate to stand at the bottom of the stairs as the guys in the suits merged with the SxSW folks. The Gulf Coast guys had just lunched to the ideas of Trammel Crow II, the son of the famed Texas Real Estate magnate. The SxSW guys were generally younger and hipper than the Gulf Coasters but a few were actually signed up for both conferences. The day before, I had listened to Michael Mann, the climate change scientist who had been credited with developing the famous Hockey Stick graph showing how global temperatures were beginning to shoot up due to Climate Change. He had come to Austin to promote his book and to be part of the SxSW program. In his talk before the conference, Professor Mann spoke about the amazing harrassment he has received from certain Congressmen who believe that his work his bogus and that somehow he is part of the so called greatest Hoax ever perpetrated on humankind....Anthropogenic Climate Change. His recent book, “The Hockey Stick and the Climate Wars: Dispatches from the Front Lines,” includes an account of his personal experiences as he finds himself being attacked for presenting his findings to the world. As a climate scientist, I have seen my integrity perniciously attacked, politicians have demanded I be fired from my job, and I’ve been subject to congressional and criminal investigations. I’ve even had death threats made against me. And why? Because I study climate science and some people don’t like what my colleagues and I have discovered. Their attacks on scientists are part of a destructive public-relations campaign being waged in a cynical effort to discredit climate science. My work first appeared on the world stage in the late 1990s with the publication of the third assessment report of the Intergovernmental Panel on Climate Change, which featured what is now popularly known as the hockey-stick graph. Using what we call proxy data – information gathered from records in nature, like tree rings, corals, and ice cores – my co-authors and I pieced together the puzzle of climate variability over the past 1,000 years. What we found was that the recent warming, which coincides with the burning of fossil fuels during the Industrial Revolution, sticks out like the blade of an upturned hockey stick. With the help of well-oiled politicians, ill-equipped and often complicit media outlets, and vested interests like the fossil-fuel industry, climate deniers have tried to portray the evidence for human-caused climate change as some house of cards – a hoax that’s teetering on a single hockey-stick graph. Like Madison Avenue advertising man Roger Thornhill, Professor Mann finds himself thrust into the world of spies and liars where he is mistaken for a man that doesn't even exist. The oil and gas framers and spinmeisters, after stealing his emails and the emails of his colleagues, have tried to eliminate him as a scientist and run him down from above. There were around 2,000 participants in the SxSW eco event this week. For the most part, these folks are good committed folks to a planet and a plan to heal the earth and our communities. But they don't fully understand that Philip Vandamm is out there perverting the truth and misleading the innocent. 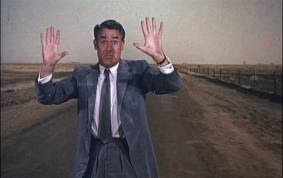 And even when you escape Mr. Vandamm, you will find yourself in the comfortable arms of Eve Kendall. 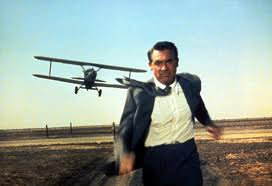 How long will it take before all the Roger Thornhills that are going to South by Southwest Eco realize that the movie we are living is more like North by Northwest, and that rather than coming to Austin to enjoy our clubs and parties, they will come to organize and do what must be done. Perhaps in the third act.